I saw these cookies on Pinterest awhile back and was immediately intrigued. 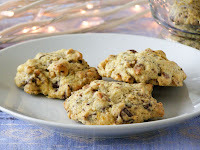 I love sesame seeds, in fact sesame snaps are probably one of my favourite treats so I loved the idea of a sesame seed cookie. 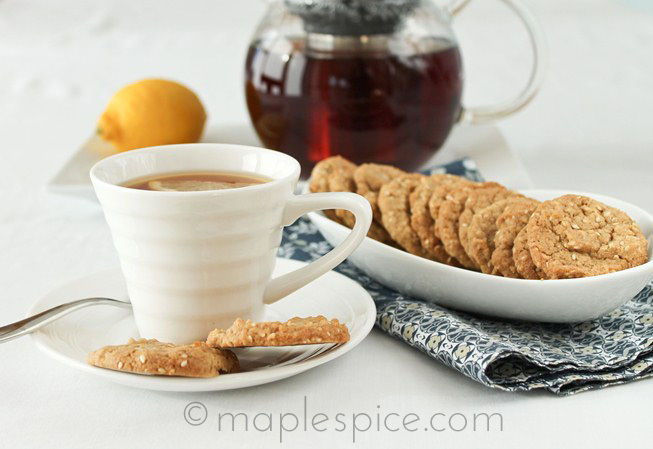 They turned out beautifully - a crisp, buttery brown sugar cookie flavoured with toasted sesame seeds and lemon. 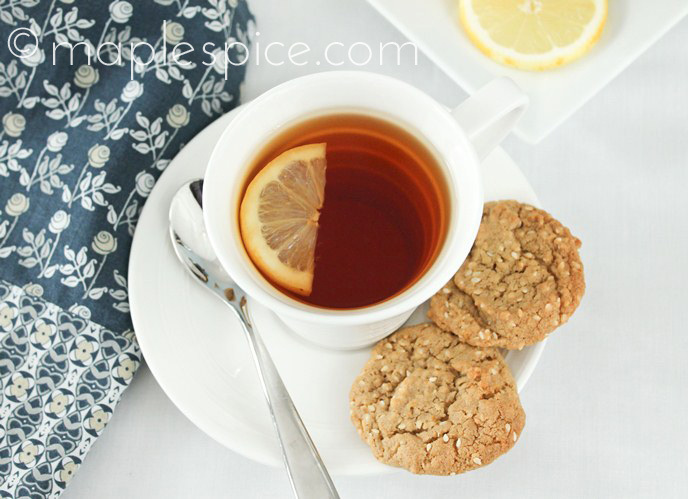 Gorgeous with a cup of Earl Grey tea! The recipe comes from All Recipes but I have made a few little changes. Obviously, I've omitted the egg. (For the record I tend to find if a cookie recipe only calls for 1 egg you can simply omit it with no problems). 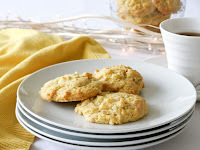 I also added a pinch of salt and some vanilla but mostly changed the method of making these cookies to the more traditional way of creaming butter and sugar first, then stirring in the dry ingredients. Just one small note though - these are best eaten on the day they are made as they do get chewy the next day. That's not a terrible thing mind you, they are still very good - I certainly happily ate mine! You'll just have to call them lemon sesame chews instead - ha! Preheat the oven to 180c / 350F. Spread the sesame seeds out on a baking sheet with sides and toast them for 10 minutes giving the pan a shake a couple of times. 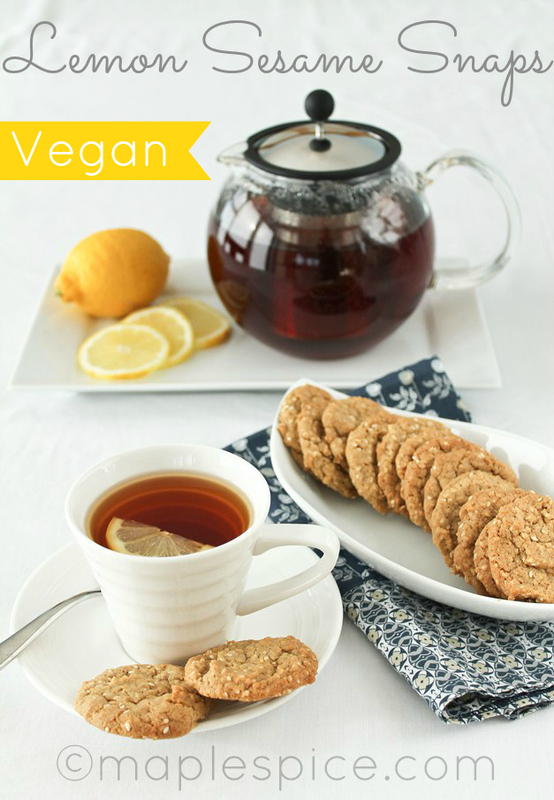 Beat together the vegan butter, brown sugar, lemon zest and vanilla until light and creamy. Whisk together the flour, baking powder and salt. Stir into the butter/sugar mixture until no more flour shows. Stir in the toasted sesame seeds. 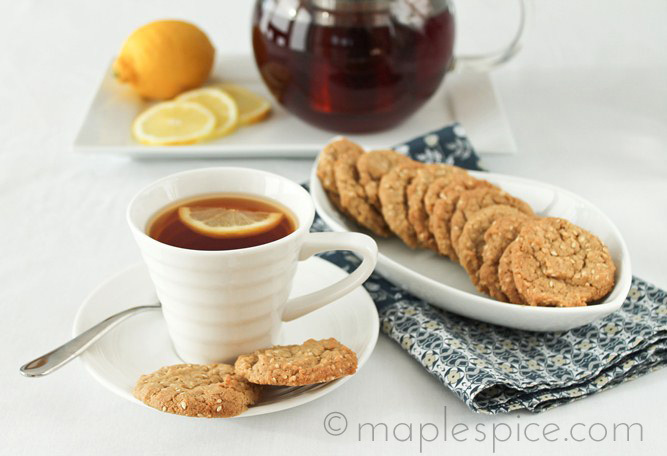 Drop by teaspoons onto a baking sheet lined with baking paper and bake for 7 - 10 minutes. The edges on the cookies will just be starting to brown. Remove and place the sheet on a wire rack. The cookies will be far too soft to move at this stage. Simply leave them to get firm on the baking sheet, this will only take 5 minutes or so. Once firm, transfer them to a wire rack to cool a bit BUT these are best eaten now!! 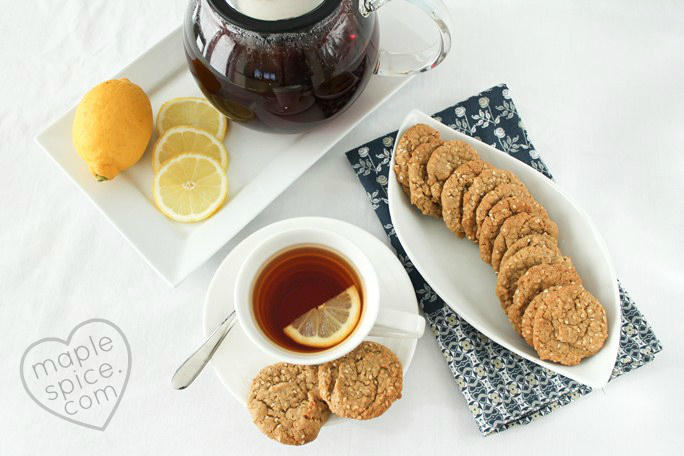 Source: Based on All Recipe's Lemon Sesame Crisps. 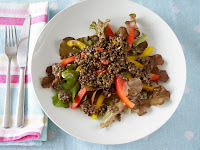 You know, I love cauliflower but have rarely (if ever) blogged with it. I usually just like to throw it into my macaroni and cheese with some zucchini and I always have some in my curries but nothing to really blog about...but I got it in my head to make a cauliflower salad and came up with this. Make sure the florets are of a fairly small size then steam until just tender. This should take no longer than 10 minutes, just fork test them now and again. Meanwhile measure the olive oil in a small bowl. Slowly add the lemon juice whisking all the while. Whisk in the salt, sugar, poppy seeds and a few grinds of pepper. Taste and adjust seasoning if need be, because, hey, we're all different! Tip the warm freshly steamed cauliflower into a large bowl and pour over the dressing. 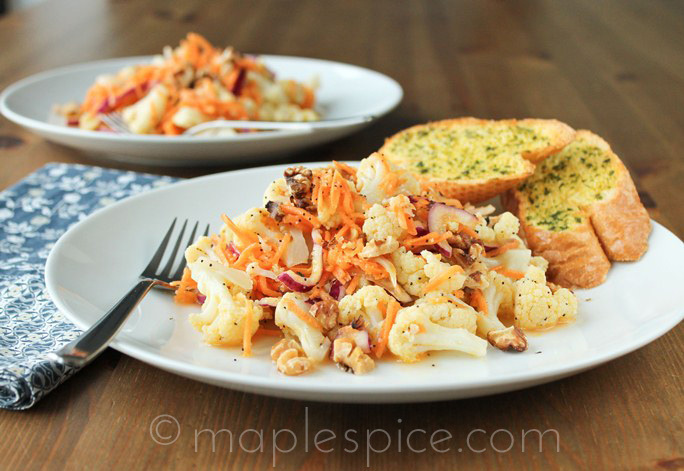 Mix gently using a rubber spatula until the cauliflower is well coated. 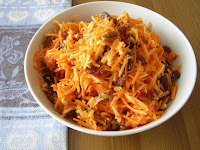 Add the red onion and carrot and mix well. Cover with cling film and refrigerate to allow the salad to marinate and cool. 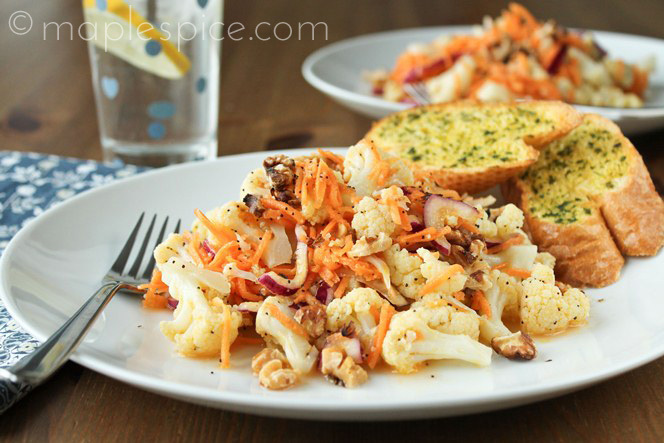 While the salad is chilling preheat the oven to 180C / 350F and place the whole walnuts on baking sheet with sides. Toast for about 7 minutes or until lightly golden and very fragrant giving the pan a shake now and again. Remove and roughly chop - not too fine. Leave to cool. 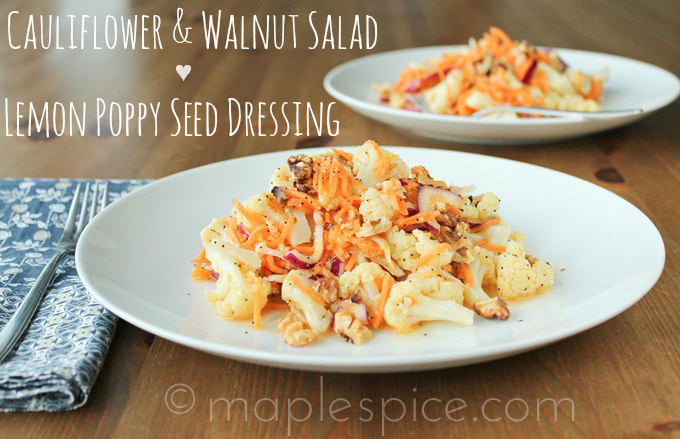 Once the salad is chilled dish up onto 2 plates and top with the toasted walnuts. Nutritional Information: based on 1 serving. A Happy Valentine's to all!! Best cake I've ever made. I mean that. 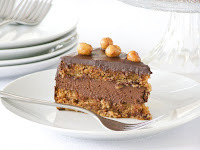 I know I post a lot of mousse cakes, I simply love them. 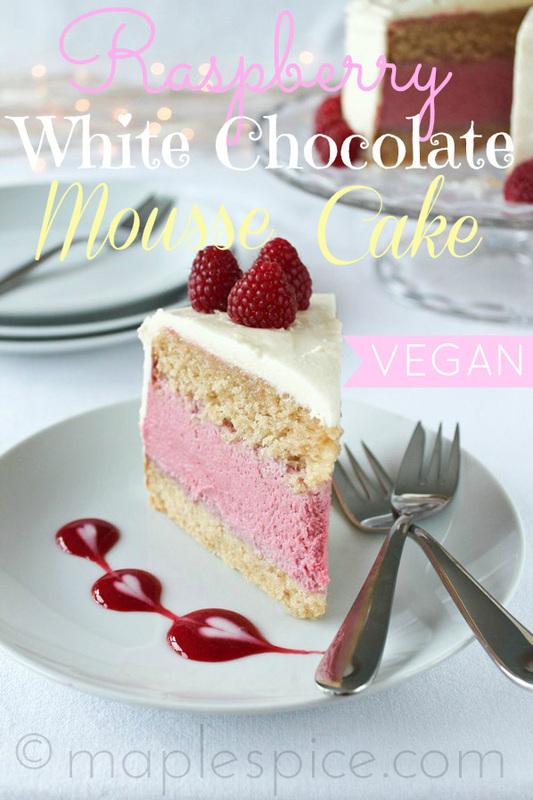 I love mousse and I love cake. It's an easy marriage of flavours and textures for me. This cake has been in my head now for at least a year. 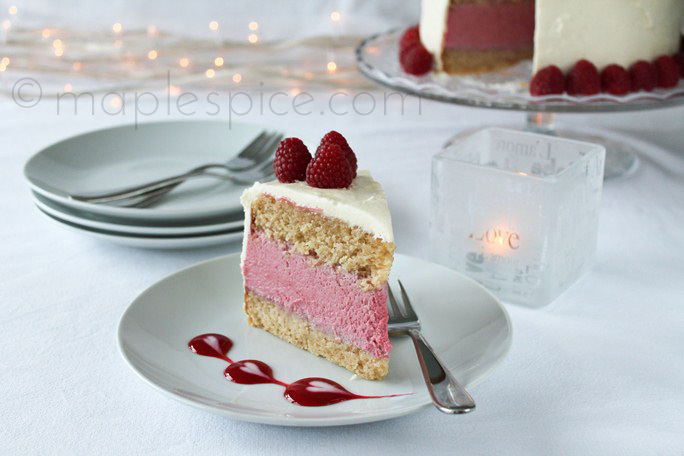 I was inspired by this Iced Berry Mousse Cake on BBC Good Food and wanted to make something similar. 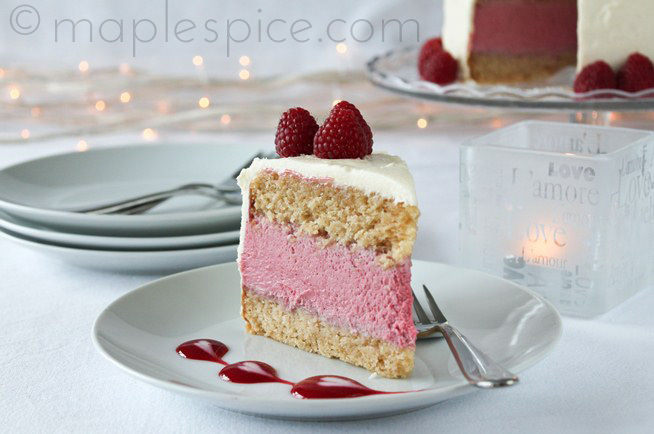 I'm personally not keen on frozen cakes so made mine as a regular cake, kept the mousse just raspberry and added white chocolate, essentially so that the mousse would set, then covered the whole thing in an almond buttercream. 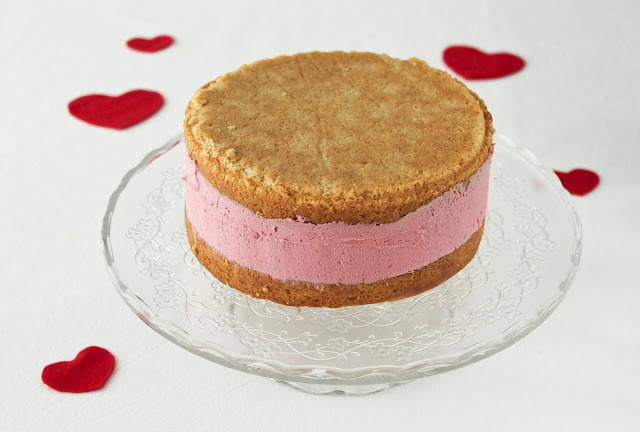 It's simply heavenly - A basic vanilla cake (which I've FINALLY made one I'm proud of) with a tart yet sweet raspberry mousse which is bursting with berriness and a proper moussy texture then covered in an almond buttercream which just goes so perfect with the raspberry flavour. I served it with a little extra raspberry coulis which is leftover from making the mousse and it's altogether to die for. 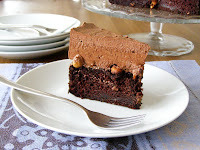 Now, the only thing I'm going to sugar coat here is the cake - as making this is both a little difficult and expensive. 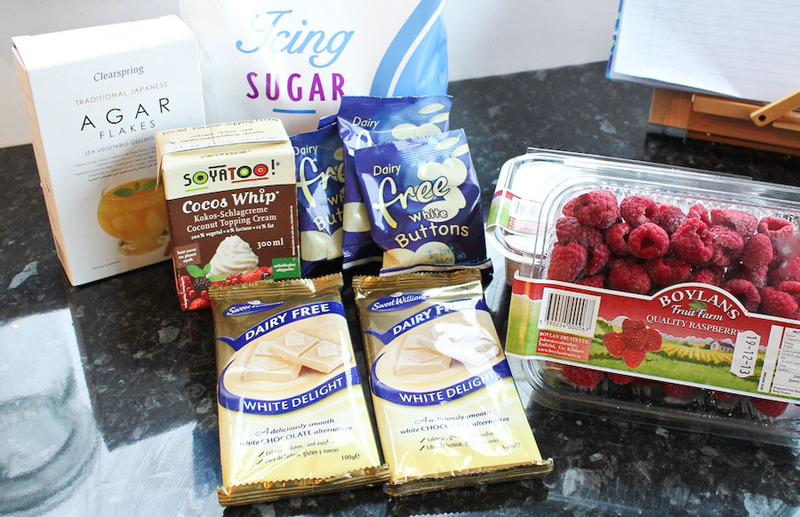 Yes, I've used some perhaps hard to find ingredients - vegan white chocolate and coconut whipped cream and to be honest, I don't know how replacements will fare. 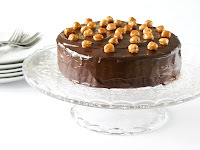 For both cost and time reasons this simply isn't the type of cake I can make a few times to experiment with! Day 1 - made the cake. Day 2 - made the raspberry coulis then set it with agar. Day 3 - made the mousse and assembled the cake. Day 4 - let the cake set. Day 5 - frosted and decorated. You don't have to spend so long making it but it is easier when broken down into steps like that. I certainly wouldn't attempt to do it all in one day! Now, I'm afraid I was a bit of a bad blogger and didn't take any step by step photos but I'll talk you through it best I can! Preheat the oven to 180C / 350F. I used a 3.5" high 7" diameter loose bottom cake tin, lined the base with baking paper and sprayed the sides with cooking spray. In a large bowl beat together the butter, sugar and vanilla until creamy. In another bowl sift together the flour, baking powder, baking soda and salt. In a large measuring cup whisk together the soy yogurt, sparkling water and vinegar. Alternately add the flour and liquid to the butter mixture starting and ending with the flour. So you add 1/3 of the flour mixture then half of the liquid, 1/3 of the flour mixture, last of the liquid then last of the flour. Mix in with a rubber spatula using a quick folding in movement and only mix until well blended in after each addition - take care not to overmix. Pour and scrape the batter into the prepared tin, level off the top and pop it into the preheated oven for about 40 minutes. It should be firm on top, bounce back a little when pressed on top and a wooden skewer inserted in the centre should come out clean with just a few crumbs attached. Remove from the oven and leave to cool on a wire rack, in the tin. Once fully cool remove the tin and carefully slice the cake in half. I find it easiest to use a serrated knife and slice all the way around not cutting all the way through - just do the edges so you have an even cut. When you have sliced all the way around THEN cut all the way through. Carefully separate the two layers and wrap each in cling film. If you have done this a day or two before just leave them at room temperature. 1. 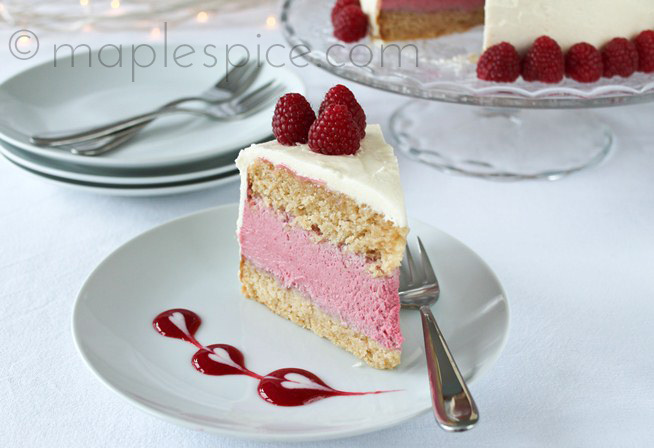 Use frozen raspberries that are just frozen raspberries - unsweetened with no syrup. You can use fresh but as this worked for me, I recommend frozen. 2. I used agar flakes, if using the agar powder the equivalent amount would be 1 tsp. Will it work? I don't know. 3. I used Soyatoo Cocos Whip which is a coconut based whipped cream. I usually make my mousse with their soy based one but I felt the coconut would be a nicer flavour in this as I tend to find the soy one quite beany and feel it needs a lot of dark chocolate and alcohol to mask the flavour. Texture wise I feel the soy version would work just fine here as it's easier to find. The Cocos Whip product is quite different from coconut cream from the cans mind you - I don't think that would work as the mousse will go really hard in the fridge. Place the raspberries in a large saucepan and bring to medium heat. Do not add any liquid as the raspberries will release their own juice. Stir now and again until the have defrosted and released liquid. Add some icing sugar to taste now but note - you want to keep this tart as you'll be adding a lot of very sweet white chocolate to the mousse later. I added 1/4 cup and it just took the edge off the sourness but left the mixture still tart. Depending on the sweetness of your berries you may not need to add any. 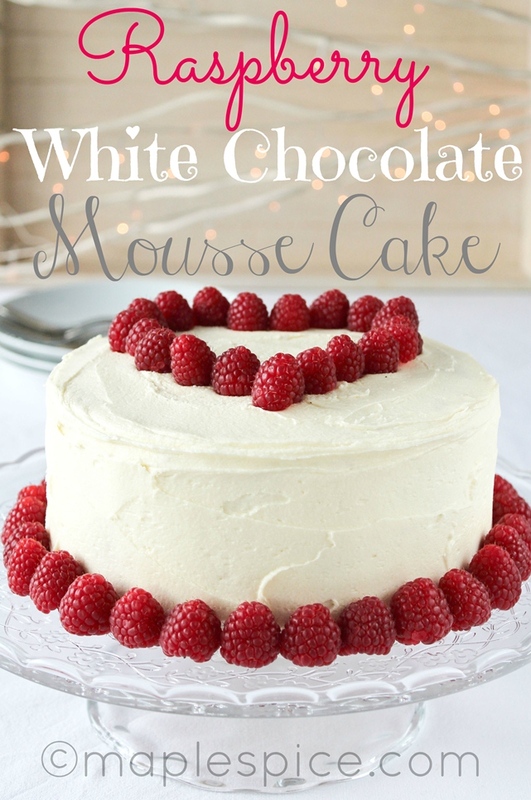 Remember you can always add some icing sugar to the mousse once it is made. Let the mixture cool slightly then place in a blender and blend until smooth. Now pour the mixture into a fine sieve over a large bowl and push the mixture through with the back of a spoon until it has all gone through leaving all the seeds. This will actually take longer than you might be thinking and a little muscle power! Now that you have your coulis, cover it with cling film and chill in the fridge until cool as it will most likely still be warm at this stage. Once cool, measure 250 ml of the coulis into a saucepan and sprinkle over the agar flakes. 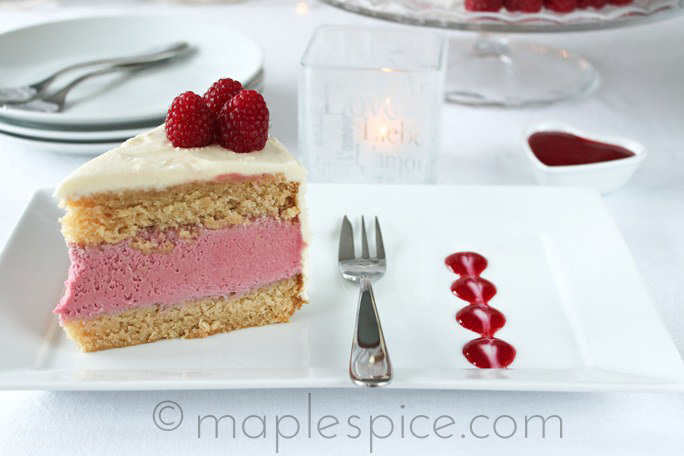 (Keep the leftover coulis in the fridge for serving with the cake.) Put the heat onto medium and let it come up to a simmer without stirring. Now stir it now and again while the mixture simmers for 5 minutes. Remove from the heat, pour into a bowl and leave it to set. I left mine out for about an hour then covered it with cling film and put it in the fridge. Remove from the fridge and it should feel set. Take a spoon and beat it until smooth. As I had a few grainy bits I then pushed mine through a sieve a second time (it's easier at this stage) just to ensure it was really smooth. A photographic reminder on why you are doing all this! Place the room temperature coconut whipped cream in a large bowl and whip it with a whisk for a couple of minutes. Break the chocolate into pieces and microwave until melted. Transfer the melted chocolate to another bowl so it can cool down faster. Take a spoonful of the set coulis and whisk it into the whipped cream, keep adding spoonful's and whisking until all the set coulis is added. You should have a vibrant pink looking mousse right now but remember - it won't taste very sweet at this stage! Wait until the melted chocolate is close to room temperature before adding to the mousse. When you do add it try and pour it in slowly while whisking quickly all the while to ensure the chocolate does not seize up in the mousse - this is also why it is important to make sure the chocolate is not too warm. It helps to have someone else pour the chocolate in while you are whisking. Once all the chocolate is added, you have your mousse. Give it a taste and if you find it too tart you can add a bit of sifted icing sugar but do note that it will taste better once it has set. Take the pan you baked the cake in and fully line it in cling film. 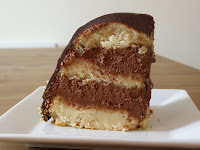 Place one half of the cake in the bottom, pour and scrape all the mousse over top then place the other half of the cake over top - make sure you use the best looking, flattest half of the cake for this. Fold over the overhanging cling film to fully cover the cake and place in the fridge for the mousse to set. 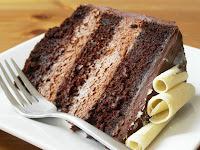 While I didn't take any new photos of this there are step by step photos on how to do assemble a similar cake on my Double Layer Chocolate Mousse Cake post. Note - this will make more buttercream than you actually need but it's better to have more than run out! Beat the butter with some of the icing sugar then add the extract. Keep adding icing sugar, then some milk until all is added. 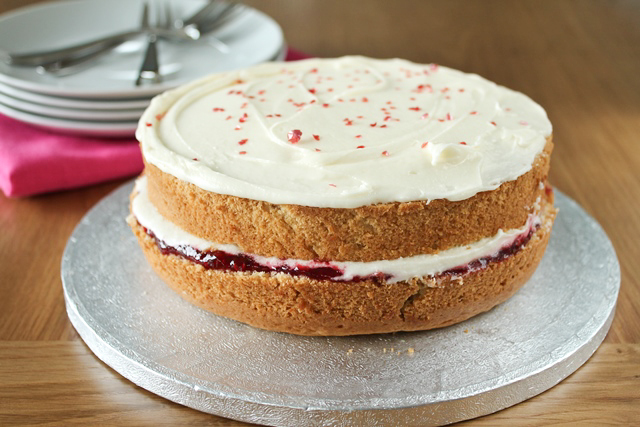 Adjust with more icing sugar if too wet or a few drops more milk if too dry. You want a soft, spreadable frosting. 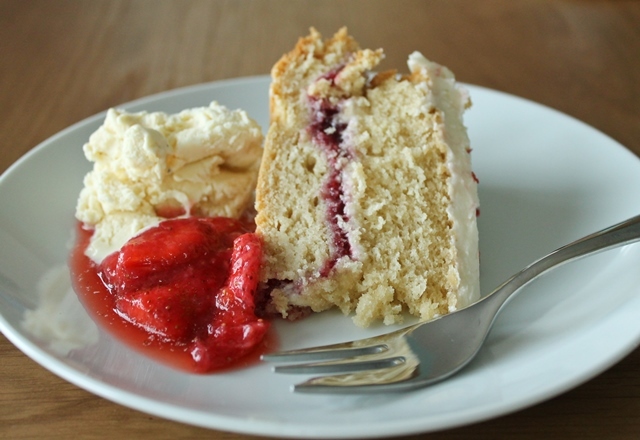 Remove the cake from the fridge and lift it out of the tin by the cling film. 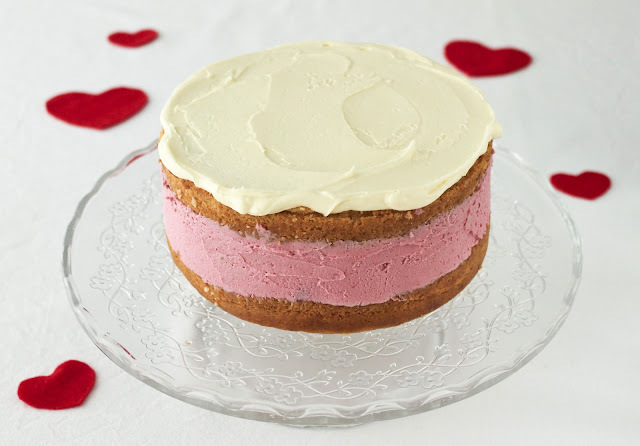 using a large flat spatula and taking care lift it up and off the cling film onto a cake stand or serving plate. Take a butter knife and smooth out any mousse that may be sticking out further than the cake, just so it'll be smooth when frosted. The cake I based this on actually had no frosting, just a dusting of icing sugar and you certainly could just give it a dusting of icing sugar for a less sweet cake. As you can see, it still looks pretty darn good! ...or you could just the frost the top if you don't want to cover the whole thing in frosting. BUT, I do recommend frosting the whole cake, don't overdo it, just enough to cover the cake will do. 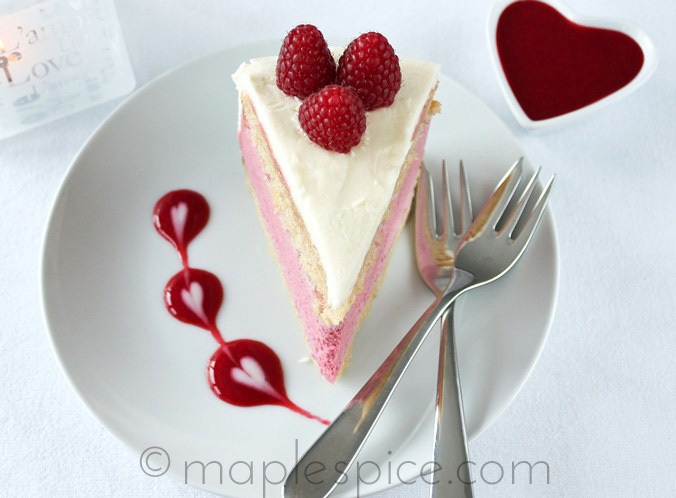 Save any leftover frosting for cupcakes or to touch up the cake - like when you are photographing it and your backdrop falls down on top of the cake (!) Yes, that did happen to me. Thankfully I got a shot of it whole before the big accident! 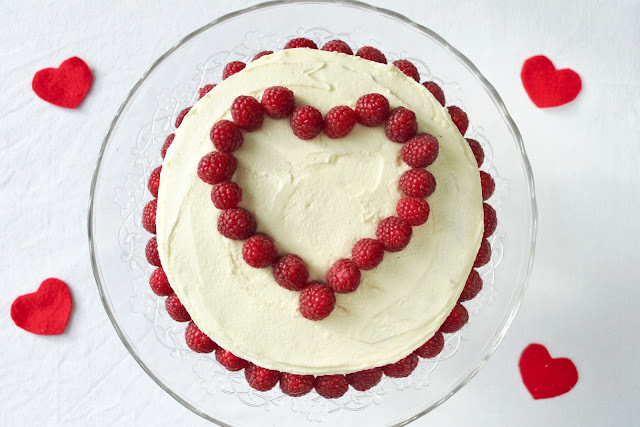 I then decorated the top with fresh raspberries in a simple heart shape and placed some more around the base as it looks nice and tidy. For this 7" cake we got 16 small but satisfying slices out of it. To serve with the coulis, remember that you left the coulis tart to accommodate the white chocolate so you'll need to add a little sifted icing sugar to the leftover coulis to sweeten. Just whisk some in to taste. To make the little heart designs I did on the plates there I placed a good size drop of coulis on the plate, fairly close together. I actually used a little plastic syringe - the type you get with children's Nurofen! In the middle of each blob I placed a drop of a mixture of plain soy yogurt sweetened with a little icing sugar. Then just take a toothpick or wooden skewer and run the tip right through each blob, making sure you drag the white bit through as well. It's actually so much easier than all this sounds! Nutritional Information: based on 1 slice out of 16. I made this cake for my mother-in-law's birthday and it was soooo good, once more, I am so happy to finally have a vanilla sponge cake recipe that works. 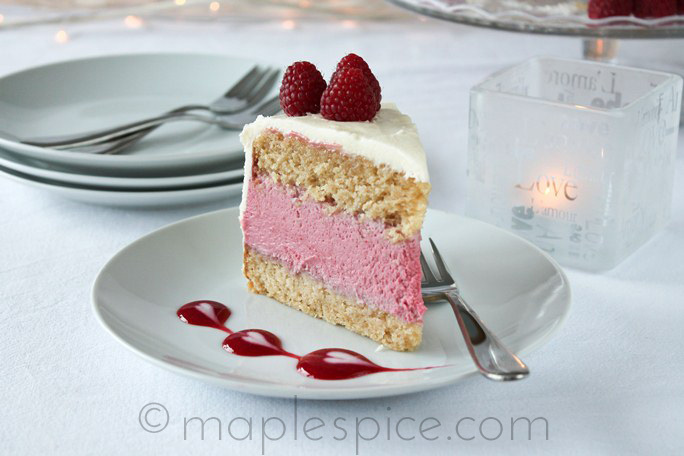 Tasty, light, fluffy and easy - yay! I followed the cake recipe as is but split it between two 7" round cake tins lined with baking paper. Baked until golden and a toothpick comes out clean and left to cool. Made HALF the amount of the almond buttercream then simply spread raspberry jam in the middle with some of the frosting and frosted the top. I served it with fresh strawberries in syrup - simply toss sliced strawberries with some sugar and leave for about an hour - they'll make their own syrup. If it's TOO liquidy simply drain it away and add half of the liquid back to the strawberries.